Tesla Motors CEO, Chairman and Product Architect Elon Musk, at the wheel, and Chief Designer Franz von Holzhausen take the prototype Tesla Model S all-electric 5-door sedan for a spin after its unveiling in Hawthorne, Calif.
Tesla Motors may be struggling to find a place to build their factory but they know where to open up their sales departments. The San Carlos-based, once to be San Jose-based, electric car maker is set to open three European sales officers in London, according to a news release obtained by our friends at the Silicon Valley Business Journal. 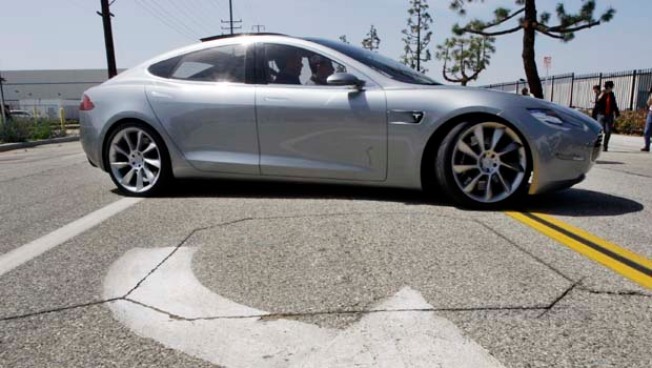 Tesla was scheduled to build a plant in San Jose to manufacture its cars but pulled the plug on that quicker than the chord was cut on the original electric car. The journal goes on to report that Tesla is looking at potential sites in Munich and Monaco as well. The company plans to start selling cars in Europe in June.